About a hundred people from Calgary's local Bangladeshi community gathered outside city hall today to protest recent violence in the country. 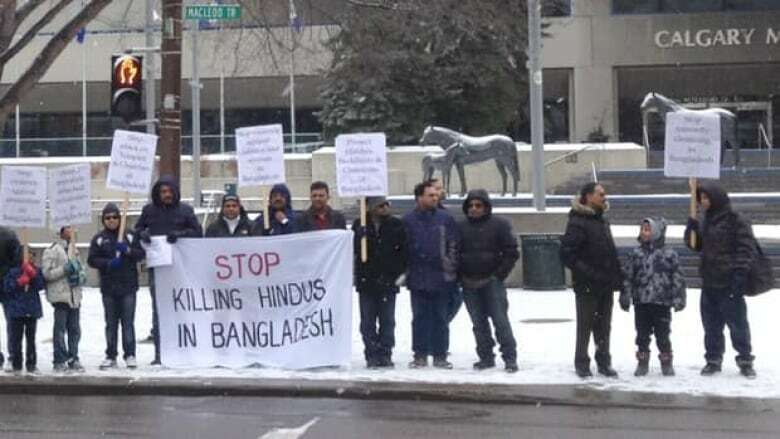 About 100 people from Calgary's Bangladeshi community gathered outside City Hall Sunday to protest recent violence in Bangladesh. Dozens of Bangladeshi minorities there have been killed and their churches and temples burned down in a recent series of deadly clashes. "Nobody's standing for the minorities," said Kiron Banik, the rally organizer. "If international pressure come to the government, the government should protect their citizens, especially the minorities. It's their fundamental rights." The violence is tied to verdicts and sentences handed down to members of the country's radical Islamist opposition by an international war crimes tribunal. The tribunal was set up to try people accused of war crimes stemming from Bangladesh's 1971 war of independence.